Its been a while since I last posted, Christmas has been and gone and I hope you all had a lovely time. I was very busy with customer quilts in the run up to December. I loved this colourful quilt made by Frances who requested an allover design. This one was also made by Frances and gave me free reign to do as I wished. I kept it simple with some feathers in the center blocks. This next one was a full custom job and this is all I can show you out of respect for the customers privacy. I've also been busy working on Bonnie Hunter's annual mystery quilt. Another cracker but more about that in my next post. I'm going to call the quilting you did in that cream colored border "Feathers without Borders!" Love, love, love it! I have just today discovered you and your beautiful quilts and quilting. Pretty excited that you often make Bonnie Hunter's mystery quilt, as i have been looking at my Allietere for a year so uncertain how to quilt it. Your work has given me some direction and i thank you for sharing photos of your Allietere. 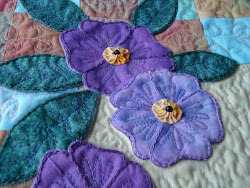 I am very new to free motion quilting, but will attempt some simplified designs as soon as possible . Missing your posts. Hope you're back soon.